My Current Wardrobe Count: October 2014 | Save. Spend. Splurge. 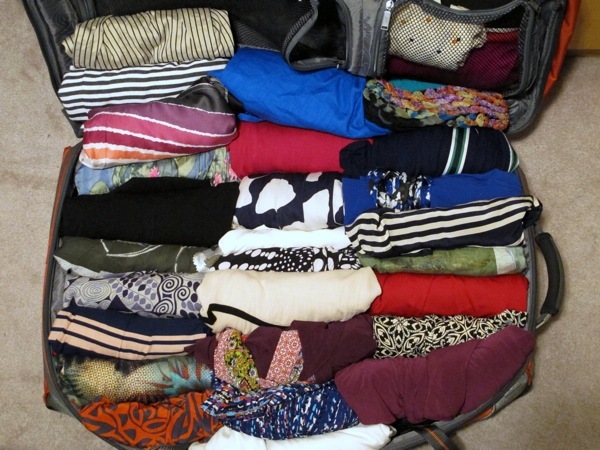 I did not include my jewellery, underwear, or my lounge/home clothes like sweatpants and ratty t-shirts or tank tops that I can never wear outside, because… I can’t wear them outside of the home. This is just clothing I can wear outside to work, or what have you. I am obviously very heavy in the tops and dresses department. Let’s face it, the fact that I can go a month and a week wearing a different dress each day says something, no? I also really like long-sleeved shirts (which include button-ups by the way). There’s something about a crisp white silk shirt that tugs at my heart strings. My scarves are also a pretty hefty collection but that was to be expected, as I consider them a staple accessory. I could probably cut down on my total number of items to 150 or even 100, but I don’t really have the energy or the willpower to. I think over time, I will be weeding out items I no longer wear and doing it like that. I think I’m going to start reinforcing the one-in-one-out rule. If something enters my wardrobe, something has to leave. My plan is that going forward, I am going to start culling down my wardrobe pieces. I obviously don’t wear all of them but I need to do this over a year so I know what I don’t wear for ANY season, or I wear only in certain seasons (e.g. sweaters in autumn and winter). I already started getting rid of things and we’ll see how low I can go. One thing’s for sure though, I do not need any more clothes. I DO NOT NEED ANY MORE CLOTHES. I only need to refer back to this post to confirm this. I have 22 dresses, three of them are for formal occasions (one for winter, one for autumn and spring and one for summer – I live in a Nordic country). But I beat you in the amount of scarves: 26 🙂 I agree that they are a staple accessory and I use every single one of them. Some of them are from the 90s! Earlier, I had trouble spending money on items like boots and cardigans. I don’t have many of them, so they get a lot of wearing. I always thought the ones with good quality were super expensive and bought cheaper alternatives, which often didn’t last that long. But then I got this Closet plus-app and have been using it to find out how much I spend on clothes and how much I wear them. That’s when I realized that the price per wear for my boots and cardigans was like nothing! Definitely worth spending money on those so that they’ll last long. This app, by the way, is a great help when packing (I’m traveling a lot). It also has helped me to see which items don’t get worn enough to justify their place in my closet. I always feel like I both have way too many clothes and also I don’t have nearly enough. I’d wager I consistently use about 75% of my wardrobe. The other 25% are pretty dresses which I almost never wear (but for some reason always want more of?). I use my entire wardrobe, it seems. I just really like variety, I’m starting to see that I can cut down on 2 pairs of pants and so on, so that is helping me see why I don’t reach for certain things (due to colour for instance). I like pretty dresses too. It’s my kryptonite. I have to stop. I can see why you don’t need more clothes. Your clothes are beautiful! It’s like having a zen garden that fits in your suitcase and you can take anywhere. The only things I added to my wardrobe to survive my first Canadian winter were two pairs of thermal socks, a pair of boots with cleats and a pair of mittens. I have ALL of that. 🙂 I’m really prepared for any eventuality. As for the sweaters, I don’t wear them at work in the office and I only have neutrals so they match every blouse or top I have. Same with blazers. I don’t have a huge variety of toppers but I have a lot of tops that go with those neutrals. If you love and wear everything, then I think your wardrobe is just the right size! I’m no fashionista and I found that I was only wearing certain items over and over. So I looked into capsule wardrobes and got rid of a lot of stuff I didn’t like. It opened up more more options with fewer pieces. I know that now when I reach in the closet I’ll pull out something that I like to wear. One trick I heard a while ago was to put all your hangers in backwards. As you wash your clothes put them back the right way. At the end of the year it will be easy to tell what you haven’t worn. through all the clothes though. Cardigans aren’t my thing as a variety but I do have them in neutrals. I let the blouses or dresses do the speaking for me..
I’m curious about the seven pairs of gloves! 😀 What kinds/styles are they? This is so cool. I’ve always wondered how many outfits I could come up with in my wardrobe. For me it could be months before I repeat an outfit. Wow. You have 36 dresses?? I have… 2. Arguably 4 if you throw in an old bridesmaids dress and a prom dress. ^__^; I was thinking I need to up my dress department. 36!!!! Although 5 are very formal for weddings and so on. Not VERY office friendly but I could make it work. I love the graph – very visual. If I did a similar count, I would probably have just about as much as you. Although, I think you surpassed me in dresses. I have a weakness for dresses. I haven’t counted my wardrobe items but one time counted shoes and found to my dismay that I have over 30 pair. That includes snow boots, slippers etc. I was shocked. I usually wear maybe 3 or 4 pair! I’m retired and don’t need alot of clothes but I do keep a couple of nice suits and dresses on hand for funerals and weddings. Otherwise its usually jeans and t-shirts. I was surprised too. Then I reviewed each pair of shoes and realized it depended on the outfit and weather. I could stand to cut down about 3-4 pairs more if I had to but I don’t want to. It was a surprising post for me although the dresses did not surprise me. I do wear a lot of dresses to work though.